Pilates is a method of corrective exercise and physical movement designed to stretch, strengthen and balance the body. The program is based on the methods developed by German-born fitness expert Joseph H. Pilates, in the early 20th century. Known as the Pilates Method, the series of more than 500 controlled exercises is a full-body technique, which trains it’s practitioners to integrate the use of mind and body during the performance of its exercises. Through this integration, Pilates creates positive overall physical benefits. The system increases physical awareness by emphasizing core muscular control and proper body alignment. The Pilates Method employs sound biomechanical principles, and produces excellent results for people of all ages and abilities. Joseph Pilates devised his equipment for rehabilitation purposes, by taking springs from beds and rigging them to create spring resistance and “movement” for the bedridden. The spring resistance utilized by Pilates machines is unique, as it replicates the natural lengthening and contracting movement of muscles, which is different from the static resistance of weights. This equipment both challenges and supports the body, as it learns to move more efficiently. There are three major pieces of equipment invented by Joseph Pilates: the Reformer, the Cadillac and the Mat. The “Universal Reformer” has a moving carriage with springs attached to it, and uses straps to hold feet or hands, and provides supports for the back, neck and shoulders. The Cadillac, also known as the Trapeze Table, was considered by Joseph Pilates to be the “Cadillac” of all pieces of equipment. Resembling a four poster bed, it is a higher, table like structure, with a framework of poles around it. From this framework, springs are hung to perform exercises. The Mat is also considered a piece of equipment. Though the Mat work is done without the assistance of springs or support, the series of exercises developed on it by Joseph Pilates strengthens the core, using the muscles of the deep back and abdomen. The student must rely on his/her own strength to perform them. 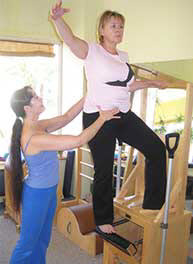 In addition, there are a number of auxiliary pieces of equipment invented by Joseph Pilates which are often used. The Low Chair or “Wunda Chair,” is a lower piece of equipment resembling a bench with a paddle attached by springs. Exercises are performed by pushing on the paddle with various body parts in many positions, including standing, sitting, and lying on the Chair and floor. There is another chair, the High Chair or “Electric Chair,” which resembles a high-backed chair, and provides great stability and support during exercises. And, there are number of other pieces of equipment, including the High Barrel or “Ladder Barrel,” the Spine Corrector, the Foot Corrector and Magic Circle, among others. All the pieces of equipment and routines supplement each other, and engage the entire body.